His songs can be a beautiful love story, historical in nature or a novelty song, Johnny was the writer for many of these classics. We have a good selection of Johnny Horton lyrics with chords as well as for many other older country artists. We specialize in the good stuff, “classic country songs”. 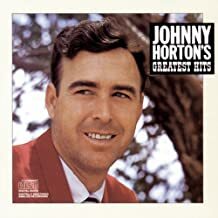 Johnny Horton died early in his career in an automobile accident, but left us with a legacy of his great songs. Johnny was an avid fisherman and loved it almost as much as singing. We will always appreciate the music he left us with to enjoy as well as playing and singing it ourselves. Whether you’re an accomplished guitar player or a beginner, playing and singing these great old country songs are very entertaining. For us less gifted players, most of these songs have simple chords and are not difficult to play. It’s not about how good you are, it’s about enjoying music every way you can. All you have to do is make the effort to learn a few chords and you can add an element of pleasure to your life, it's amazing what a stress reliever it can be. It's a great hobby! !